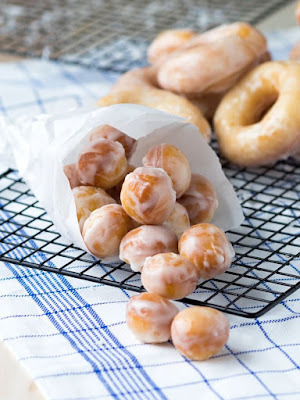 Original Glazed Donuts (Krispy Kreme Recipe Copycat) | FoodGaZm.. This was a great doughnut recipe. I must say that I do not care for the glaze recipe. It was a little too "vanilla tasting for me. I about 2/3 cup of powdered sugar and 1 1/2 Tbsp. milk to sort of tone it down. This made 25 - 3 1/2 to 4 inch doughnuts (as well as the doughnut holes). I did double glaze a few of the doughnuts as another viewer suggested and it gave it a thicker glaze that you find on many bakery doughnuts. As far as the doughnut preparation, I began by mixing the yeast and hot water together. I also added 1 tsp. of sugar to the yeast mixture in order to give the yeast something to feed off of, and i set it aside about 10 minutes to let it proof. This allows the yeast time to activate. I did knead the dough after mixing in all the flour because my dough had a slight batter appearance. I floured my board really well and kneaded it for about 3-4 minutes until it had enough flour in it to make a firmer dough but not stiff. I probably ended up adding about 1/4 to 1/3 cup of flour on my board to get it to the right consistency. After rolling them out, I did let them rise about 14 minutes longer than called for because I was busy getting the glaze ready. They were very fluffy. Overall this recipe was great. The kids even said to keep this recipe!